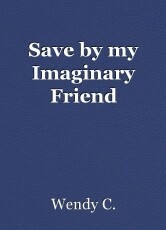 Save by my Imaginary Friend: Chapter 1, book by Wendy C.
Emily is kidnapped by a man with different personalities. Emily was not a normal child. Emily had a fear of going outside and she was afraid of people. The only people she would talk to was her parents. Emily has to be homeschooled. Emily's mother taught her. Emily has a friend who no one could see. Emily's invisible friend was Cassie. Emily's parents thought Cassie was an imaginary friend that Emily make up. Cassie was a real person. Emily was only 8 years old. Emily was born in 2000. Emily's parents were named, Jack and Lucy Brooks. Jack and Lucy were watching the news. The news was talking about a man who kidnapped three girls and one girl was found alive. The man's name was Kevin Wendell Crumb. The police were still searching for Kevin with no luck. “I hope they catch this Kevin Wendell Crumb. Those poor girls.” Lucy told her husband Jack. “I know Lucy but I am sure the police will catch him because Kevin's pictures are all over the news and newspapers,” Jack says. “Well, at least we do not have to worry about Emily.” Lucy says. After, Emily's doctor appointment she was going to see her psychologist today. Emily's psychologist was Dr. Karen Fletcher. Dr. Fletcher was a really nice person and understood Emily but Emily did not know why she has to see a psychologist. Emily's parents were very rich people and could afford the best. Emily starts getting ready and got some books to read. Emily was hoping that weird looking guy Kevin was not there at Dr. Fletcher today because Kevin scared her. Even Cassie did not like him. Emily could not believe that Dr. Fletcher was dead. Emily's mom would not tell her how Dr. Fletcher died. Emily did not ask. Emily was going to miss Dr. Fletcher very much. Dr. Fletcher did her best to help Emily. Emily wishes Cassie was here. “Emily do you want to reschedule your doctor appointment?” Lucy asks Emily. “No, Mom, I need to go.” Emily answers. Emily was ready. Emily's parents were both going to work so their driver was going to take Emily to the doctor. Emily was already in the car when she thought she saw Kevin Crumb walking around. Emily did not know why Kevin would be in her neighborhood. Emily puts Kevin out of her mind. The doctor visit went by fast and Emily was on her way home. The driver stops and got gas. Emily is waiting in the car. Emily heard the car door slam. The car starts taking off. “Ray is everything ok?” Emily asks. There were no answers. “Ray, why are you not answering me?” Emily keeps asking. The car stopped in an abandoned place. “I am not answering you because I am not Ray," Kevin says, turning around from the driver's seat. Emily was scared. Kevin put on a mask and spray her face with something that makes her go to sleep. Kevin drove somewhere far away from town. Kevin has been planning on kidnapping Emily for a while, but Emily never came outside. Emily's house had a lot of alarms so Kevin did not take a chance on being caught. WOW! that's very powerful. I already love Emily to bits :) looking forward to the rest. Well done.